Almotamar.net, Google - More than 60 people were killed and around 135 injured after a massive bomb struck a Shia suburb of Baghdad, amid growing fears that sectarian violence may once more engulf Iraq. According to Interior Ministry officials, the blast came at 7.30pm from a bomb hidden in a motorised rickshaw, the explosives covered by fruit and vegetables. It hit a bird market in the vast area known as Sadr City which saw some of Iraq's fiercest fighting during times of sectarian violence. It is the latest in a series of attacks which included Iraq's deadliest in 16 months on Saturday, when a car bomb targeted a Shia mosque in Taza near the northern city of Kirkuk, killing more than 70 people and flattening 80 houses. The spike in violence is widely thought to be related to the imminent June 30 deadline for American troops to withdraw from Iraq's cities, as doubts remain about whether Iraq's forces are ready to maintain security in the still-volatile country. The handover has been gradual and US forces handed control of Sadr City to Iraqi forces at the weekend, but the area had already been struck on Monday when a roadside bomb hit a school bus, killing three high school students and wounding 12 others. Security in Iraq has improved dramatically in the last year, with the civilian death toll at 124 in May 2009; the lowest since the 2003 invasion. But deaths have soared in recent weeks and Prime Minister Nouri al Maliki has warned that attacks will likely escalate further as US soldiers withdraw. Calling the bomb in Taza an "ugly crime," he accused insurgents of trying to spread mistrust of Iraq's security forces. However, he has repeatedly insisted that Iraq's police and Army are ready to take charge of security, calling the US withdrawal a great victory for Iraq, which demonstrates the country's sovereignty. He has refused to delay the planned pullback of US troops according to the timetable set out in the Status of Forces Agreement agreed between the US and Iraq, which came into force earlier this year. A national holiday has been declared for June 30 - although security concerns may mean a curfew is also imposed. Speaking at the weekend, Mr al Maliki, who has built his political popularity on bringing stability to Iraq, said that any extension of the June 30 deadline would show a lack of confidence and be a "historic setback,"adding that "we will not retreat no matter what happens." 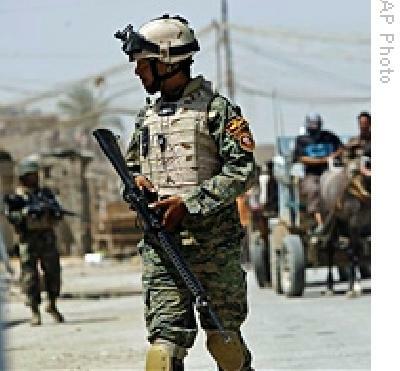 Today's blast came after a spokesman for the US military in Iraq, told reporters that after June 30, some US soldiers will remain at posts called Joint Security Stations to train and advise local security forces. However, "the amount of forces remaining in the cities for stability operations will be extremely small," he said, while refusing to confirm exact numbers. General Ray Odierno, the top US commander in Iraq, who had previously expressed doubts about Iraq's cities, particularly Mosul, told a press conference last week that, "the dark days of previous years are behind us...It is a fitting time that our combat forces move out." However, today in Mosul, which is considered by some to be the last hold-out of the Sunni group al-Qaeda in Iraq, seven civilians were killed when a man hit a US patrol with a grenade, an Iraqi soldier wounded by a car bomb and an off-duty policeman killed in a drive-by shooting.